Hashknife Hartley and Sleepy Stevens are wandering cowboys who become unofficial detectives on the ranches they work on. Author W.C. Tuttle narrates the stories. 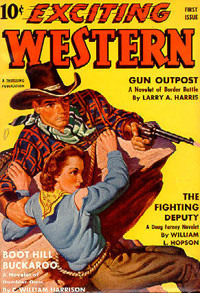 His favorite characters, Hashknife and Sleepy, appeared in many of his more than 1000 stories, published mostly in pulp magazines. He was also a screenwriter during the Silent Movie era, with 52 films to his credit between 1915 and 1945. Tuttle was born in Montana, and worked as a sheepherder, cowpuncher, railroader, baseball player and cartoonist. From 1935-43 he served as president of the Pacific Coast Baseball League. This collection contains all episodes known to be in existence. Be the first to comment on "Hashknife Hartley and Sleepy Stevens"